In this module you will explore life, death and rebirth and the nature of mind. Learn to use the fear of death to overcome the fear of death. Discover how to use the certainty and imminence of death to enhance your quality of life. 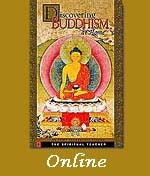 A 26-minute video for Module 5 from the Discovering Buddhism DVD. Six teaching sessions and four guided meditations taught by Dr. Nicholas Ribush. PDF transcripts for all these teaching and meditation sessions are also provided.